Among the wildlife on land and sea who have figured large in the daily lives and work of On Wings Of Care volunteers, those who have loomed largest by number since 2003 have been raccoons. 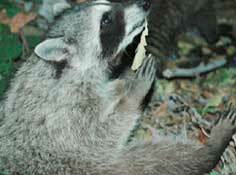 While our refrigerators and freezers remain stocked with the ingredients to simulate mother's milk for most mammals ranging from mice to black bear, the volume of our regular orders for raccoon formula rivaled those for most other animals combined. It all started by accident when a pair of week-old raccoon babies were handed to us in a parking lot high up in the San Gabriel Mountains, where they had been found cold and nearly dead. A boy and a girl, they turned out to be (we weren't knowledgeable enough back then to be sure which they were!) -- later named Rocky and MaeBelle. An hour or so in our warm hands and under our shirts, and they were definitely alive. 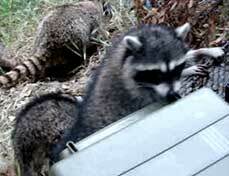 In the course of raising these two young raccoons, under the watchful and instructive eyes of licensed rehabbers, we learned more about love and play and freedom and fun than from any other animals we had ever known. As soon as they were able, they lived wild and free in the mountains above and around our home in the San Gabriels above Los Angeles; but they returned to visit us frequently. Rocky disappeared in a horrendous flooding winter storm just before he was a year old, but MaeBelle remained a regular visitor and family member for five years -- returning frequently with other females and with babies. She greeted our two dogs and three cats like they were her sisters and friends, which of course is just what they were to her. 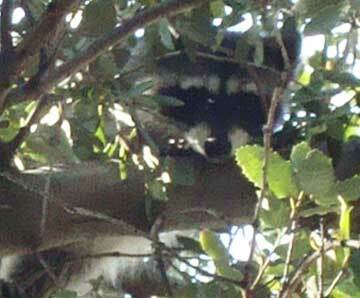 In the years since raising Rocky and MaeBelle, we had the opportunities to raise and release many, many more raccoons. Each of them has had a different and special personality and appearance, to us. While many of them continued to visit us regularly for up to a couple of years, none but MaeBelle ever remained so attached and returned as a family member through so many years of living wild. She was an extraordinary friend. And we learned what few people get to appreciate: raccoons are extraordinarily intelligent, social, playful, affectionate, and responsive. Getting past that sentimental digression into our personal experiences raising raccoons, there has been much more "conventional" wildlife-related services provided by On Wings Of Care volunteers over the years, for raccoons as well as other wild mammals and birds. In these stories, you'll hear about and see photos and videos of raccoons raised by other, more conventional rehabbers and rescue facilities, and raccoons and other mammals rescued from accidents with traps, cars, fires, or removed from structures and needed placement in the wild. We love to help with these releases, as it gives us chances to see these wonderful critters up close, and more important, we get to use our familiarity with the mountains and other wild habitat of southern California for the benefit of these animals. It is a marvelous sight to witness the first foray into forests and streams of young wildlife who were raised in cages as orphans and may never have seen or climbed a tree that was taller than about eight feet or played in water that wasn't in a small plastic swimming pool. We go to great lengths to find the "perfect" release sites, where there will be trees and dens to offer protection from predators, fresh water and good food sources, and no or minimal human intervention. We always try to return to release sites a few times during the first few months after releases to look for evidence of predation or other failure to survive. We have only ever found one released raccoon that was killed, and that was a cougar kill in a vicinity where there had recently been a serious fire (after our release), so any raccoons who had not successfully evacuated the area would have had no place to hide or escape a predator. We hope you'll enjoy studying these photos as much as we still do! In time, we'll get around to including captions for some of them, so you, too, can recognize some of these furry characters.